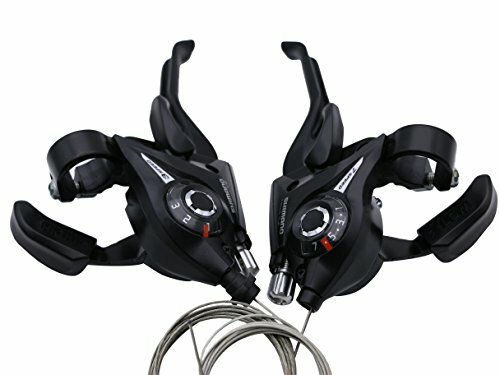 * The Shimano Altus ST-EF51 Shifter Brake Lever set is a lightweight set of integrated shifters/levers great trigger shifters, thumb shifter. * High flexibility, Visibile Optical Gear Display indicator to confirm the gear position with number at a glance. * Replacement of the interior wiring. * Set the handle at the top position. * Unscrew the screw remove the protection cover. 1.Can the lever and shifter be seperated? No, it's all one piece. 4.Where is this product made? Include Singapore, Malaysia, China and so on. 5.Does this shifter have original package? 6.Is this shifter/brake level combo set work on my trek road bike? In general, trek road bike has only two front gears, if so, it will not work. If you have any questions about this product by INKE, contact us by completing and submitting the form below. If you are looking for a specif part number, please include it with your message.